Although physical abuse dominates headlines, it is not the only issue domestic workers encounter. “Everybody’s nice if you didn’t borrow money yet, but if it’s time for them to collect, they are rude,” says 30-year old Celine Barung* from the Philippines. Like thousands of other maids, years after her arrival, Barung is still repaying debts tied to the placement fees charged by the agency that first recruited her for work in Hong Kong. 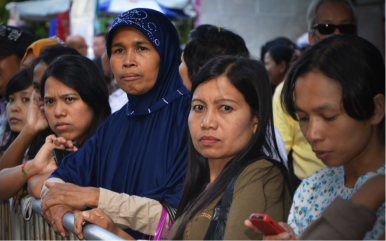 The recent case of Erwiana Sulistyaningsih, who was allegedly assaulted by her Hong Kong employer, brought media attention to the physical abuse suffered by some domestic workers, but many others, like Barung, suffer an injustice not often spoken about: financial abuse. The anti-slave charity Liberty Asia has announced that it is building a database that will gather complaints logged against abusive recruitment agencies and moneylenders in Hong Kong and across Southeast Asia. The goal is to have a single, searchable database capable of identifying patterns of abuse and frequent offenders. The online nature of the database will allow charities, lawyers, and other interested parties to access the data regardless of their location. Financial exploitation is most often inflicted by recruitment agencies that withhold jobs until they receive large sums of money labeled “placement fees” or “agency commissions.” Helpers who cannot afford to pay are pressured into borrowing money from friends and family. Those for whom this is not an option are frequently introduced to moneylenders. When Barung decided to seek employment as a domestic helper outside her native country, she had to turn to a specialist recruitment agency. “I got an employer in a short time,” she says. “The agency was saying, ‘Provide it [the money] now, so that you can go now.’” Not having money for the placement fee, she felt pressured into accepting their advice to borrow money. The agency persuaded her that the number of Hong Kong employers was limited and that she should not miss this opportunity. Charging for recruitment services is not illegal, but the placement fees demanded of domestic workers are often disproportionate to the salaries they earn. In an effort to stop agencies taking advantage of migrant workers, some countries have set fee caps or abolished them altogether – as is the case in the Philippines. Charities and NGOs, however, claim that the practice of charging fees is still very common. Charities and NGOs dealing with helper-related issues typically collect complaints on paper forms, which given a lack of resources are rarely digitized. This has made it difficult to connect one complaint with another or identify agencies that are repeatedly reported. This is where Liberty Asia’s database comes into play. In Hong Kong, more than 300,000 foreign domestic workers (FDWs) are employed to assist with domestic duties and the care of children and the elderly. The minimum monthly wage for domestic helpers is HK$4,010 ($529) and the eligibility requirements for employers are very basic (HK$15,000 monthly household income – or asset equivalent – and Hong Kong residency). For many families, employing a domestic helper is a necessity rather than a luxury due to limited childcare facilities. Catering to this demand are specialist recruitment agencies in Hong Kong that collaborate with partner agencies in the helpers’ home countries, primarily the Philippines and Indonesia, which account for 97 percent of all FDWs. The Hong Kong government is aware of accusations made against recruitment agencies and has taken some steps to improve the situation, such as capping placement fees at 10 percent of the first month’s salary. According to Allan, however, more needs to be done. “There is a lack of solid or serious action from the government to address the issue,” she says. Hong Kong labor laws also work against domestic workers. FDW’s must leave the territory within two weeks of terminating a contract. This time pressure gives recruitment agencies the upper hand: it allows them, according to Allan, to charge placement fees for new jobs as high as HK$21,000. Helpers fearing they will not secure a new employer within the 14-day grace period often feel that they have no choice but to go through an agency. Some abusive lenders will probably never make it into the database. One such moneylender is Angie: the matriarchal Philippine helper who lent Barung money when a family emergency demanded that she return home unexpectedly. After the terms of the loan had been agreed, Barung says they did not document the transaction. And typical of an illegal moneylender, Angie’s friendly demeanor vanished once the loan was made. When Barung tried to make small payments, Angie become difficult to find. “She would say that if you have money, then pay it back, but when I want[ed] to pay her, she didn’t want that.” Physically unable to pay her lender, Barung watched helplessly as the debt kept growing. A database will not solve all the problems associated with financial abuse, but it is a step in the right direction. Angelina Draper is a multimedia journalist based in Hong Kong.